The earthquake on 4 September 1958 that occurred in Las Melosas, Central Chile represents one of the large damaging intraplate events located in the Andean cordillera crust at about 60 km away from Santiago. 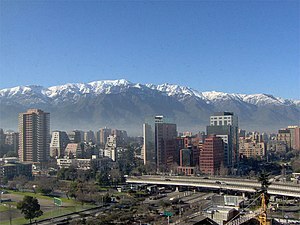 A sequence of 3 earthquakes of magnitude 6.7-6.9 in a span of six minutes struck the Andean Main Cordillera at the latitude of Santiago, Central Chile. The quakes were preceded by a magnitude 6.0 foreshock one week earlier. This seismic sequence provided the only documented effects of strong shaking related to shallow earthquakes in a subduction-zone environment in which seismicity is dominated by interplate and intermediate-depth intraplate earthquakes.